I found myself packing up for the day at the Microsoft Pro Photo Summit last week, when I was approached by the co-founder and CEO of Idee - the makers of TinEye, Leila Boujnane. Leila wanted to chat about TinEye's capabilities, as I'd just finished talking about the problems of orphan works, and the image search technologies that were on the horizon, and I mentioned TinEye, among others, during my talk. I'd not tried TinEye, but I had heard of remarkable results by trusted colleagues of mine trying it out. So, it was serendipitous that I was now chatting with Leila. I wanted very much to try it - it being in beta right now, I just hadn't gotten around to it. Though, just yesterday, on a whim, I clicked the "request an invite" link. A few hours later, I got accepted, and was curious to see the results. Some I expected, others I'm upset about. First, the expected. I looked for the first image that I had on my desktop that had seen the light of day outside of my office. And, as I've done the past two years at the Microsoft Pro Photo Summit, I was a speaker. Part of being a speaker means providing a headshot of myself, and that image was on my desktop. So, it was an easy image to choose. All I had to do was click the "Upload Image" button, select the file, and TinEye immediately processed the image into it's digital fingerprint. The results were as I expected. 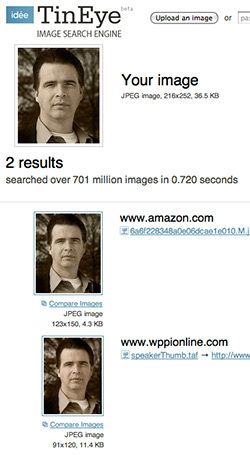 Of the over 701 million images (amongst billions and billions of images on the internet), two authorized versions of my headshot appeared - one when I did blogging for Amazon, and one for my recent talk at WPPI in Las Vegas. Both results were fine by me. Whew, I thought. I thought next to my headshot, what other image might I have made that could be in circulation and was sitting on my desktop. 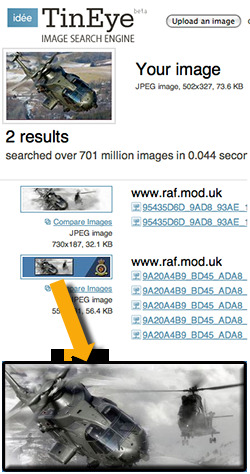 The image that came to mind - and the first one I thought of, was an image of a Harrier jump jet (it can be seen here on the second page, lower left thumbnail corner). A search for that image yielded no results, which wasn't what upset me - it was what happened next. The second image I thought of was an image I had made for a defense contractor for a helicopter that was to be very high profile. I uploaded my image, and TinEye, in under a tenth-of-a-second, returned my image as a part of a montage on a foreign government's website for their military. I was immediately and simultaneously blown away by TinEye's capabilities - applied in my real-world application, and angry because this was an infringement of my work. Grrrrr. Next, I penned a brief, and friendly e-mail to my client asking them how this might have happened, and providing them with the URL. I am awaiting their response still. Oh, and the best part? TinEye is free. 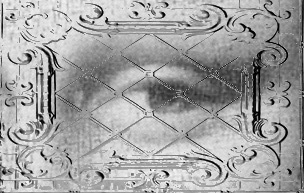 They've got a gallery of really cool examples they've found here, but this gallery shows just how many derivations of an image can still be found using TinEye, and TinEye is constantly crawling the web - adding the fingerprints of images to their database at a dizzying rate of 3,000,000 images (give or take a few hundred thousand!) a day. All around impressive! TinEye is your very own private investigator - scouring the internet for the visual pirates of the high seas and giving you the information to take responsive action. My literal interpretation of "up" and "dig." This industry continues to overflow with acronyms. It started with ASA, then we graduated to ISO, then there was APO, then DAM, not to mention all of the associations - NPPA / ASMP / APA / EP / WHNPA / BAPLA / ASPP, and so on and so forth. Why do we need another? Well, to put it simply - we do - and essentially all the anagrams that represent photographic organizations are on board with UPDIG - UPDIG is short for Universal Photographic Digital Imaging Guidelines. Before you think you know how to handle your images, stop and think that you might learn a little (but more than likely, a lot) by reading through the information they've put together. Late in the Fall of 2004, David Riecks was tasked by Susan Carr to see about forming a group consensus on digital standards, and the auspicious project was formally started in early 2005 amid a vacuum of information on best practices guidelines for digital imaging. David Riecks, stepped up to created UPDIG's first website, and in the Spring of 2005 Richard Anderson, who is on the national board of ASMP came on-board to organize and write The Guidelines, along with Greg Smith, who is the Business Practices Committee chairman for the NPPA. 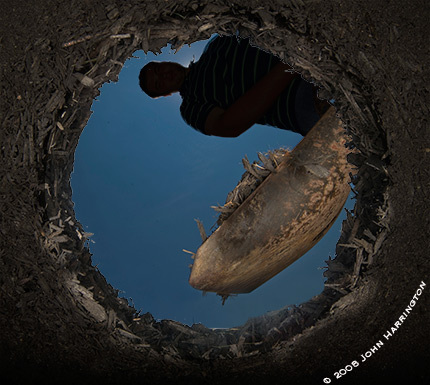 The consortium continued to grow (see all the organizations that are a part of UPDIG here), as noted on the ASMP website here - "when leaders and representatives of nearly a dozen photographers groups from around the world gathered for a "Digital Summit." They agreed that Guidelines and Best Practices were needed, should be easy to understand, and should offer options for different workflows aimed at different outputs...". APA heralded the effort here "...15 clear and understandable guidelines as well as a best practices document prepared by the the UPDIG working group of photographic international trade organizations...APA is proud to play an active role on the UPDIG working group." Even John Nack of Adobe wrote here "UPDIG describes itself as "A working group of digital imaging professionals and allied trade groups and manufacturers, dedicated to promoting worldwide standards in the commercial application of digital imaging....If that describes your trade, the site is well worth a look." If you're looking for answers about how to best handle your workflow - This is THE place to start. And since technology evolves, so too will the efforts of the working group to change with the times. How much time do you spend on SPAM? I recieve upward of a thousand e-mails a day, and about 2% of those e-mails, I want to read, and maybe 5% I have asked for. I encourage you to spend an hour of your time watching Merlin Mann give a talk at Google about managing e-mail. (Video for Merlin's "Inbox Zero" talk, 7/25/07). The good folks at Google don't waste a lot of time on numbskulls, and this guy's got an amazing approach to solving your e-mail inbox woes. By watching the "43 folders" presentation, I spent an hour of my life saving exponentially more down the line by LEARNING about how to manage my e-mail. Inbox Zero is the source. One citation that Merlin made was about David Allen, and his book - Getting Things Done: The Art of Stress-Free Productivity he talks about "Advanced Common Sense" - it could not be any more obvious, but the trouble is we don't always do the obvious. Processing - that is, doing something, isn't about checking your e-mail, it's about taking action on every e-mail, from deleting it, to responding to it. Yet, the next step is to not respond to 200 e-mails, it's processing them, and decide what it means to you - what actions do I have to take as a result of this e-mail? Do - if it's something you can do, do it now. Your inbox should be for something you haven't read yet. There's a lot going on with Orphan Works behind the scenes. 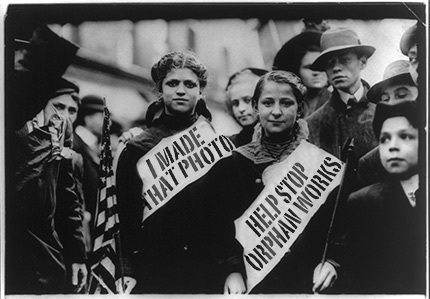 ASMP reported in their member announcement "...the House version of the orphan works bill is expected to go to mark-up very soon, perhaps this week or next," and I have heard that Sen. Sam Brownback has placed a hold on the Senate version of the bill. For how long that hold is, no one knows. That said, both ASMP and I agreed while on stage at the Microsoft Pro Photo Summit last week - and that was that this bill is not likely to make it through the legislative process this session, before dying. With their permission, I am posting here what they wrote:FROM THE ILLUSTRATORS' PARTNERSHIPWe've had word that the House Judiciary Committee may mark-up the Orphan Works Bill this week. This is the session where Committee Members will propose, accept and reject amendments to H.R. 5889. After markup, the bill could be reported out of the House Committee and go to the floor for a vote. A: It would force all creators to digitize their life's work and hand it over to privately-owned commercial databases or see it exposed to widespread infringement by anyone, for any purpose, however commercial or distasteful. Q: What about my unpublished work? A: The bill would apply to any work, from professional paintings to family snapshots, home videos, etc., including published and unpublished work and any work ever placed on the internet. A: No one has yet unveiled a business plan, but we suspect they'd operate like stock houses, promoting themselves as one-stop shopping centers for licensing art. If you've registered your work with them, they'll probably charge you maintenance fees and commissions for clearing your work. If you're a publisher or art director, they'll probably charge you search fees. If you're an infringer, they'll probably charge you a search fee and issue orphan certificates for any unregistered work you'd like to infringe. We assume different registries may have different terms, and any start-up terms will of course be subject to change. A: It will be a gold mine for opportunists, favoring giant image banks over working artists. Some companies will probably sell access to orphans as royalty-free work -- or they'll harvest orphans and bundle them for sale as clip art. Other companies can harvest orphans, alter them slightly to make "derivative works" and register the derivatives as their own copyrighted product. Freelancers would then be forced to compete against their own lost art - and that of their colleagues - for the new commissions they need to make a living. A: Only for those who intend to operate commercial databases. These registries will exist to make money. To make money, they'll have to do a lively business in clearing work for infringements. That means making their databases infringer-friendly. A: The House bill creates a very low threshold for infringers to meet. They'd only have to file a text description (not the image itself) of the work they want to infringe, plus information about their search and any ownership information they've found. A: No, as currently written, the Notice of Use is a dark archive, which means you won't have access to it. If someone infringes your work and has filed a Notice of Use, you wouldn't know about it. A: It's of no probative value to you at all unless you go to court. And if you do, you'd better be sure of winning because otherwise, without the possibility of statutory damages and attorneys' fees, it will be too expensive for you to sue. If the Notice of Use helps anyone, it actually helps the infringer: it lets him prove in court that he followed the prescribed protocol to "legally" infringe your work. Don't Let Congress Orphan Your WorkTo use the Orphan Works Opposition Website just go to this link, put in your zip code and follow the instructions. Your letters will be addressed and sent automatically. It takes less than 2 minutes to fight for your copyright.